Japanese say that autumn is for art, reading or eating, etc.. These were some good topics, suitable for “autumn for art” in Tokyoin autumn 2003. 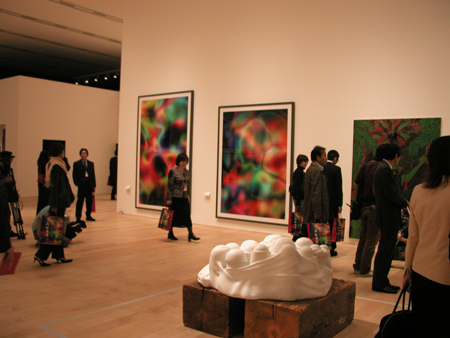 The hottest topic in the Japanese art world is the opening of Mori Art Museum (MAM). It is interesting to note that there is actually a commercial in which a ship called MAM falls from the sky to Tokyo. It’s an animation by Takashi Murakami. 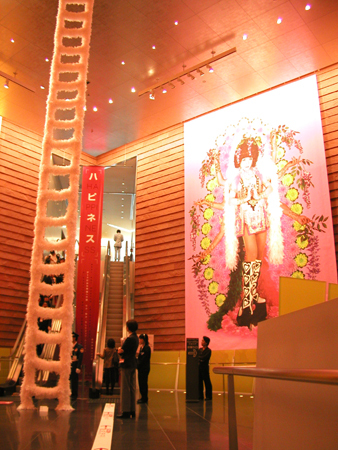 As an opening exhibition of this museum, Happiness is extremely gorgeous in several ways. First of all, its size is huge at 3000 square meters. 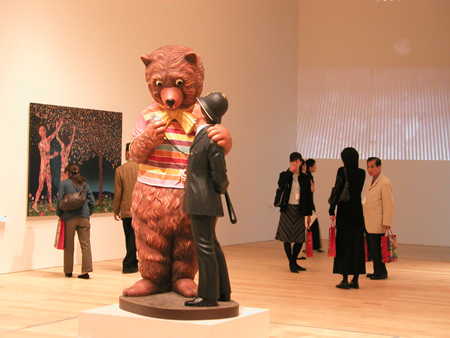 There are about 250 art works colleced from many countries and from a variety of time periods. All the pieces are representations under the theme of “Happiness”. At first it looks too mixed, but this kind of exhibition rarely happens where you can enjoy wide variety of carefully selected arts. 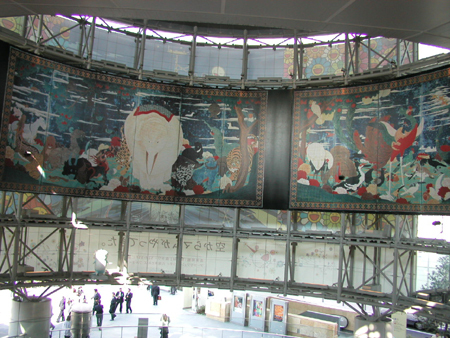 On a passage leading you to an observation platform in this museum, RokuRoku Seijin, an image character of Roppongi Hills, and their companion guide you. 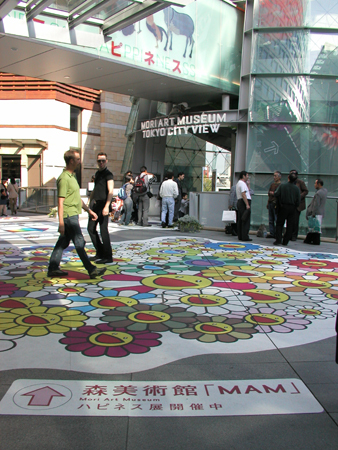 The character on the floor is also by Takashi Murakami. Next to a folding screen from the Muromachi era is Turner’s landscape painting in 1843. This way of displaying, the contrast is enjoyable. 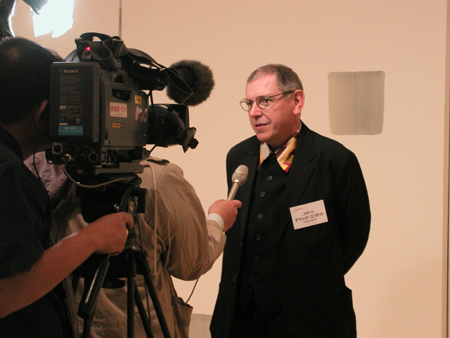 David Elliot, a director of the museum, whom I came across was being interviewed. Yasumasa Morimura’s huge works, six by ten meter, at an escalator hall linking to the 53rd floor were really overwhelming. There were four brand new works. “Chou-ju-ka-boku folding screen” by Ito Jakuchu were published in the press releases for this exhibition. It’s an incredibly spectacular piece of art. 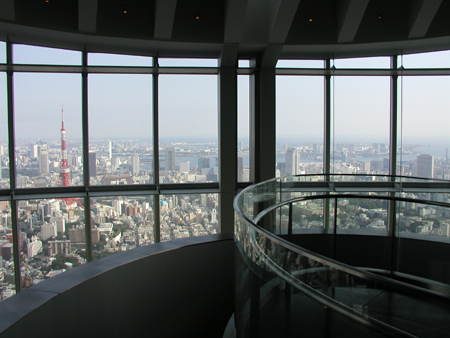 It is worth glancing at the view from the observation platform aptly titled “Tokyo City View”. What a marvelous view it is! And one can enter here with a ticket for the exhibition. 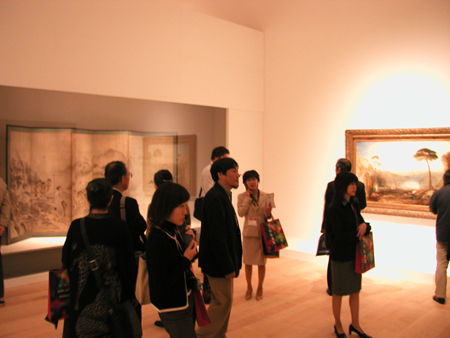 I saw some couples who seemed not to be interested in the exhibition going through the museum quickly. While I think this is also good, it might be displease for serious art fans. After enjoying the night view, I recommend stopping by the 52nd and 53rd floors.